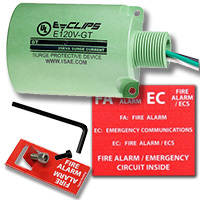 The Eclips hybrid TVSS devices are designed to safely and effectively protect sensitive electronic equipment by clamping over-voltage energy pulses and discharging them to ground. This unique design, along with the hybrid electronics, will protect critical system components. 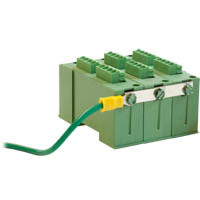 The SPD, or first surge protection device, that is truly scalable and provides real solutions. The innovative casing allows for mixed technology to be configured together that maintains system integrity by managing ground planes and structure wiring for service and maintenance. The design features slide-together modules and provides panel, screw mount, snap track, or Din-rail mounting options for easy replacement and servicing. Transient Voltage Surge Suppressors (TVSS) must have a stable ground. Eclips is the first to design an SPD that has a managed ground bus which features a single point of ground to ensure ideal connections. 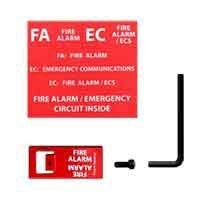 This allows you to maintain system integrity, perform inspections, and execute proper maintenance. This ensures flawless protection against transients introduced to your sensitive, low-voltage electronics and prevents costly system failures. The Space Age Electroncis T Series devies are designed as a general purpose, low-voltage surge protective devices that are extremely reliable. Each has an almost instantaneous response time to ensure that no transient voltages harm any of your electrical devices.